Whad’ya know? More Christmas tunes! 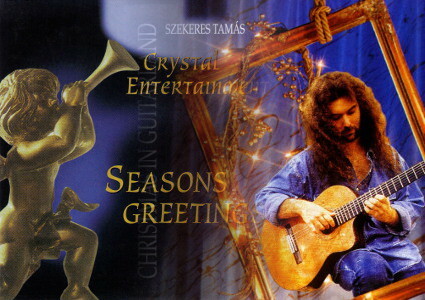 This time interpreted by Hungarian guitar virtuoso Tamás Szekeres. This CD was actually sent to me as a gift from his record label [the Dutch department in specific] years ago. A classy greeting card with a slipcase CD attached inside. Anyway, the front cover is a bit misleading as it only says “Seasons Greetings” and the company logo, but if you look at the back you’ll see the full track listing of 1991’s “Christmas in guitarland” album. The chances of finding a copy are pretty slim, so don’t let the opportunity pass by and grab the CD-rip I prepared. And since it wouldn’t be complete without the original artwork, I took the initiative to upload a separate RAR containing scans of the first release [the one I own, was reissued 5 years later and it’s merely a *sample*]. But for now the scans he’s made will suffice. Hi, just wanted to say Happy New Year! Here’s Tamás Szekeres’ live album I’ve uploaded to Axifile. Thanks a lot Gábor, I really appreciate it. Hello, could you please share the rar password? I downloaded this album off of Megaupload but cannot extract it. I haven’t found the password yet.